From Larnaca: Head out of town on the Aradippou road; turn left at the traffic lights before the Aradippou Police station and look for the hash signs. From the highway: Exit the highway at the Nicosia/Larnaca/Aradippou junction and head towards Larnaca. Turn right at the traffic lights just after the Aradippou Police station and look for the hash signs. 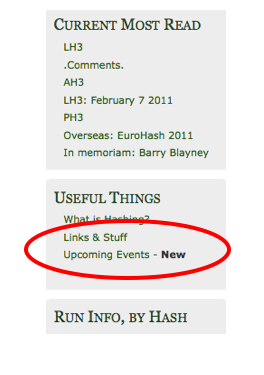 There is now a section on the website for upcoming events. Here information on anniversary runs, away weekends and special events will be listed. There is a permanent link to the page under the Useful Things section on the right hand side of each page, as shown below.